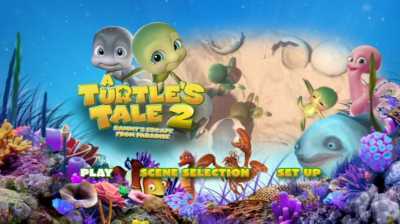 A Turtle’s Tale 2: Sammy’s Escape from Paradise (titled Sammy’s Great Escape in the UK; Dutch: Sammy’s avonturen 2, literally “Sammy’s adventures 2”) is a 2012 English-language Belgian-French animated film sequel to the 2010 animated film A Turtle’s Tale: Sammy’s Adventures. The sequel features the voice talents of Kaitlyn Maher, Khary Payton and Carlos Alazraqui. Sammy and Ray are supervising their new grandchildren, when seagulls attack them and both Sammy and Ray and two of their grandchildren Ella and Ricky are captured on trawler. While Ella and Ricky are separated and sent to the seabed, Sammy and Ray are taken to an aquarium with Lulu, a lobster with dissociative identity disorder and Jimbo a bug-eyed blobfish.